I found this jar while cleaning out my pantry of out-of-date groceries. Do you think a box of macaroni and cheese marked 2011 is too old to cook? 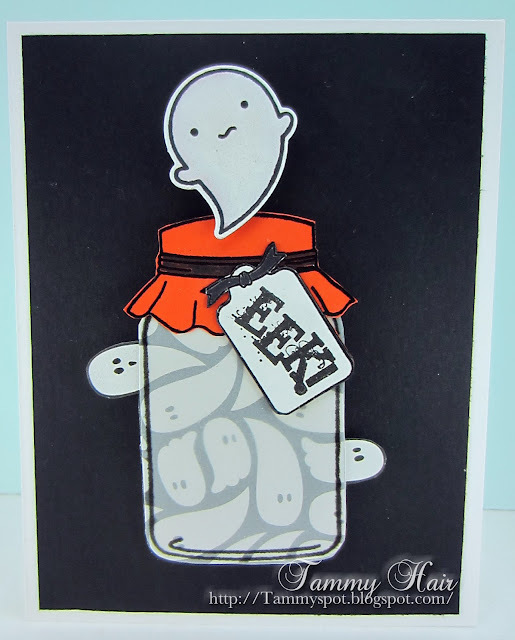 A jar full of spiders..now GHOSTS..super cute and fun Tammy..2011 mac and cheese! !..sounds like my cupboards..and I'd eat it..lol..
HA! I'd go ahead and cook that box of mac and cheese! Surely it couldn't get old. As long as it doesn't have ghosts coming out of the box I'd say to eat it! Love the card Tammy! The little ghosts popping out of the jar are so fun and cute. I think I would leave the lid on this jar! I am having enough problems these days! Cute card, Tammy! I cleaned out my pantry a few months ago so can relate to the mac and cheese! How cute and funny! You crack me up! Love how a couple of the ghosts are slipping through the jar. I cooked lasagna noodles the other day that might have been that old (maybe). A pantry can be a scary place!